Martin Wong was a chronicler of the Chinese American community in San Francisco’s Chinatown and the South and Central American, Caribbean, and African American communities on New York’s Lower East Side. While much of Wong’s work depicts the grittier side of life in New York’s East Village, Polaris offers an optimistic and fantastical vision. 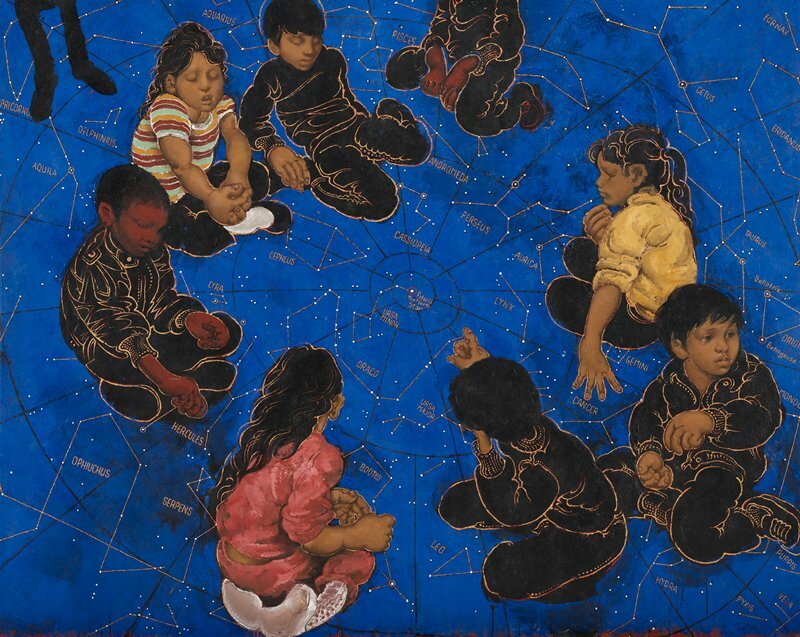 Eight children of various ethnicities sit in a circle, playing marbles, on a large map of the night sky. At the center of both the map and the canvas is Polaris, the North Star, which serves as a guide for navigation. Here the children, like the stars in the Northern Hemisphere, circle around Polaris—a symbolic beacon of a brighter future. Because of © restrictions, we can only show you a small image of this artwork.